How not to package a product. Wow that is small looking. 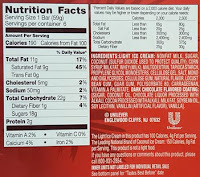 Ok, yeah, this is for coconut lovers, though I did still enjoy it (more or less anyway). It's a very bright white, very light (non-dense) filling surround by a thin chocolate shell. You can see how easily the shell just completely breaks apart. I can't say I noticed the "pieces of coconut", maybe because of the shell bits everywhere, but that's fine by me. The shell provides plenty of fun crunch but not a ton of flavor. The filling provides tons of flavor but not much texture resistance. Hmmm, kind of yin and yang thing going on I guess. 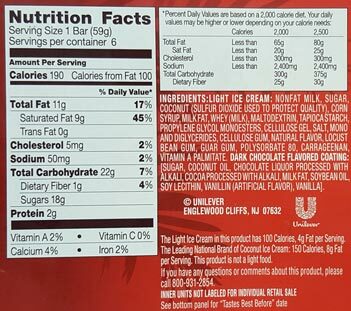 So, it's got a similar fun factor to other candy bar inspired treats, it's just aimed at the coconut crowd. No real complaints and it's nice to check this one off the to-do list. Let me know if you keep these in the freezer, but for me, I'll stick with the York version. I remember trying these back a few years ago and loving them better than the York but I also love coconut. I'm not sure my grocery store even carries then anymore! That coating doesn't look like dark chocolate. 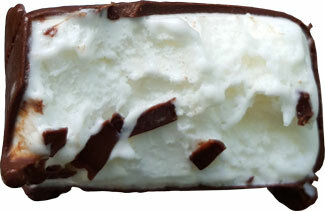 The dark chocolate Klondike bar's color looks like the picture on their package...Mounds don't.